Sterling Silver and Natural Blue Zircons with 2 Bezel Set pearls either side set along the silver chain. There are 7 large circular Zircon decorations each with 5 large stones of the Blue Zircons in the necklace measuring 3/4 of an inch each . The necklace is 16 inches long. 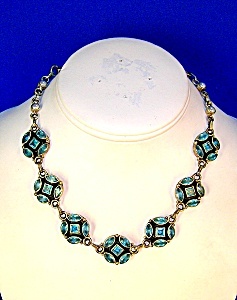 This piece is Beautiful and different on with an S clasp.